INS Kadmatt, second ship of Project 28 (P28) class Anti-Submarine Warfare (ASW) Corvettes, was commissioned into the Indian Navy by the Chief of Naval Staff at a glittering ceremony held at Naval Dockyard, Visakhapatnam today. The event marks the formal induction into the Navy of the second of the four ASW Corvettes, indigenously designed by the Indian Navy’s in-house organisation, Directorate of Naval Design and constructed by Garden Reach Shipbuilders and Engineers Limited, Kolkata. 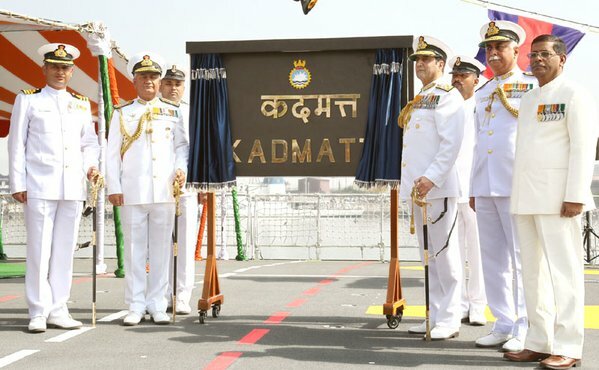 Addressing the gathering Admiral RK Dhowan, Chief of the Naval Staff said that “Commissioning of INS Kadmatt marks yet another milestone in our journey towards self-reliance and Make-in-India”. He further said that the new INS Kadmatt commissioned today, would proudly carry forward the name she inherits from her illustrious predecessor, the older Petya Class. The earlier Kadmatt, also an ASW Corvette, acquired in 1968 from the erstwhile Soviet Union, distinguished herself in the 24 years of service to the nation, particularly during the 1971 Indo-Pak war, Operation Pawan in Sri Lanka, and Operation Tasha. INS Kadmatt is named after one of the large islands amongst the Lakshadweep group of Islands off the west coast of India. The Lakshadweep Islands and the Navy share a special relation with the Island chain being home to our base INS Dweeprakshak, as well as detachments on Minicoy, Androth and Bitra Islands. The commissioning of INS Kadmatt today signifies the importance of our Island territories as our maritime interests said the Admiral. Regarded as a very prestigious acquisition, INS Kadmatt is one of the most potent warships to have been constructed in India. The ships of P28 class have been constructed using high grade steel (DMR 249A) produced in India. With a displacement of 3300 tonnes, the sleek and magnificent ship spans 109 meters in length and 13.7 meters at the beam and is propelled by four diesel engines to achieve speeds in excess of 25 knots with an endurance of 3450 Nm. Some of the advanced stealth features have been incorporated in this ship. INS Kadmatt has a multitude of networks such as Total Atmospheric Control System (TACS), Integrated Platform Management System (IPMS), Integrated Bridge System (IBS), Battle Damage Control System (BDCS) and Personnel Locator System (PLS) to provide a contemporary and process oriented System of Systems for optimal functioning of the warship. The unique feature of this ship is the high level of indigenisation incorporated in the production, accentuating our national objective of ‘Make in India’. About 90% of the ship is indigenous and the ship is equipped to fight in Nuclear, Biological and Chemical (NBC) warfare conditions. INS Kadmatt has many firsts to its credit which include the rail-less helo traversing system and foldable hangar door for the integral ASW helicopter. The ship’s weapons and sensors suite is predominantly indigenous and showcases the nation’s growing capability in this niche area. Some of the major equipment/ systems developed indigenously include Combat Management System, Rocket Launcher, Torpedo Tube Launchers and Infra-Red Signature Suppression System. The ship’s crew comfort has been a significant feature in the design of INS Kadmatt and has been ensured through ergonomically designed accommodation and galley compartments using modular concept. The ship is commanded by Commander Mahesh Chandra Moudgil and would be an integral part of the Eastern Fleet under the Eastern Naval Command. With the changing power dynamics in the Indian Ocean Region, INS Kadmatt will augment the mobility, reach and flexibility of Indian Navy.